On Christmas Eve 1970 the allaktivitetshus in Haga, Göteborg put on an evening for the homeless. This was the premiere performance of Togges Gossar. Togges was a branch springing from Love Explosion, a pop group that was part of the emerging alternative Swedish rock scene of the late sixties. Togges Gossar kept on making music well into the next millenium, playing festivities, parties and art events. The group's repertoire was a mixture of self penned numbers and covers from as varying sources as e. g. Marvin Gaye and swedish old-time accordeonist Carl Jularbo. Torgny Sjöstedt and Dennis Huntington - both hailing from Love Explosion - were the main members of Togges Gossar, but during it's existence a string of musicians participated. 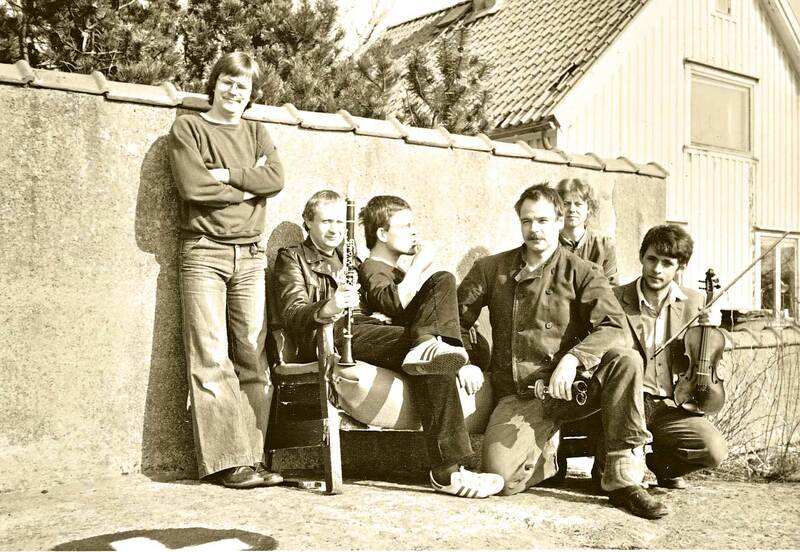 Image: during a break from the recording of Barflickans Längtan in 1979 at Långedragsvägen 77, Västra Frölunda. From left to right: Göran Berg, Ulf Dageby, Dennis Huntington, Mats Brune, Helena Östblom and Torgny Sjöstedt. Photo: Göran Hartman. En fot i jorden (single from 1988) is a tune by Torgny Sjöstedt with words by Dennis Huntington who also sings and play the drums on the record. Other session musicians on this early Sunday morning session were: Ulf Dageby (guitar), Mats Brune (DX7 synthesizer), Bengt Löfqvist (bass) and Kristian Svenberg (alto saxophone).